Lyne Renée stars in DEEP STATE as “Anna Easton,” French, 40’s, Max’s second wife and an A&E actor. She’s intelligent, kind and does good, honest work. Anna’s a great mother but she has secrets in her past and always seemed to attract the wrong sort of man. Until she met Max, that is. After so many broken relationships, finally a man who was ‘meant to be’…? 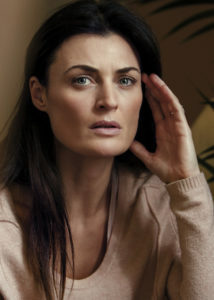 Belgian actor Lyne Renée began her acting career in Belgian theatre before moving onto screen work. She can be seen in Noah Baumbach’s critically acclaimed film The Meyerowitz Stories and as Gabriel Byrne’s wife in the comedy An L.A. Minute. She had a lead role in the British comedy The Hippopotamus and can be seen in M. Night Shyamalan’s Split. She also recurred on CBS’s Madam Secretary and was a regular on PBS’s Mercy Street. She’s previously starred in ABC’s Of Kings and Prophets and Cinemax’s Strike Back.